Comes with a generous capacity water tank that doesn't require frequent refills. The VN-D50MH is suitable perfectly well for both installation in the office and your home. Like the name suggests, its performance is more than sufficient to help get over even desert environmental conditions. 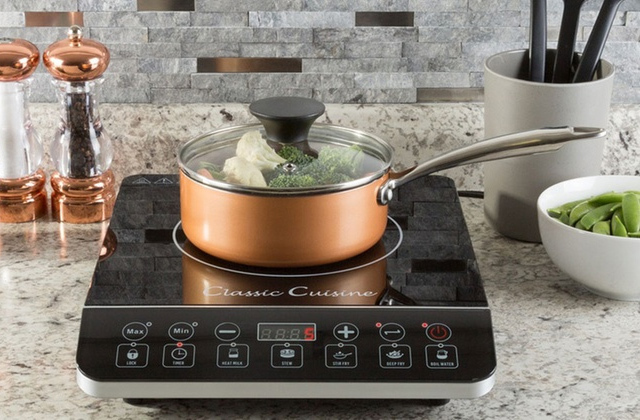 What sets this cooler apart from the other models is that it's designed for use both indoors and outdoors. Sitting on a patio or watching a TV in a living room, you will feel its pleasant cooling effect. 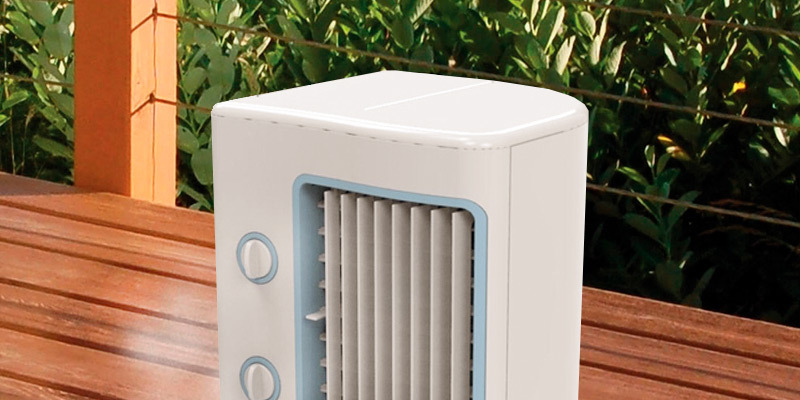 With this evaporative air cooler, you will survive the hottest summer easily. The option to connect it directly to a water system facilitates its maintenance. Features a handy mosquito net to prevent insects from getting inside the construction. May leak if filled up. 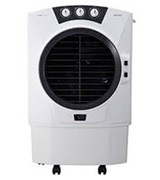 One of the best coolers for small- to mid-sized rooms. 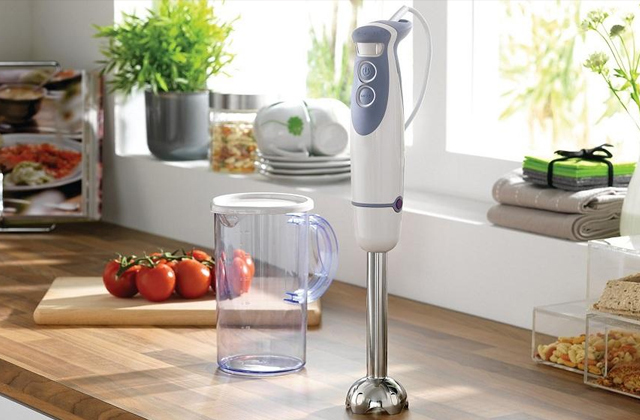 It offers power performance and efficient cooling and doesn't cost a fortune. Offers hassle-free maintenance and efficient performance. It is a perfect balance between efficiency and a reasonable price. Awkward transportation and storage due to its long height. 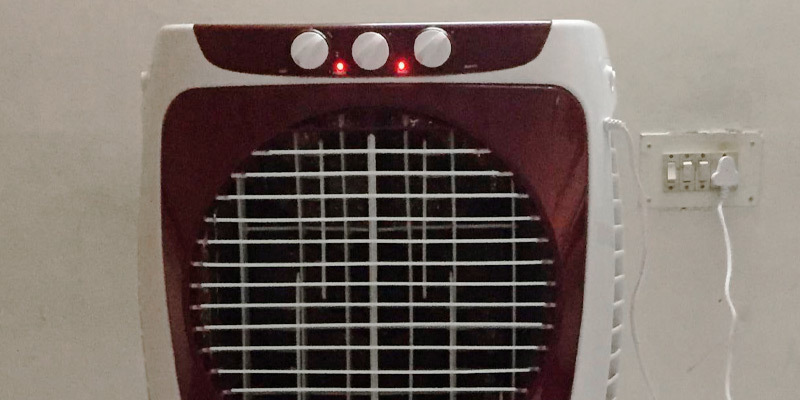 Both performance characteristics and ultra modern design set this air cooler apart from many other units with the same price tag. Will perfectly blend into any interior decor. 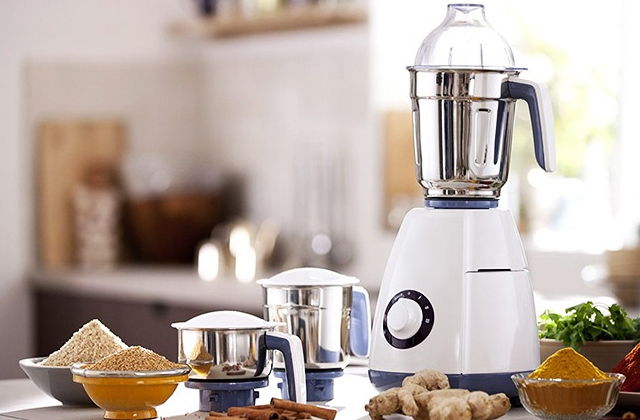 Boasts a very small and compact construction that can be set on any flat surface, including your worktop. 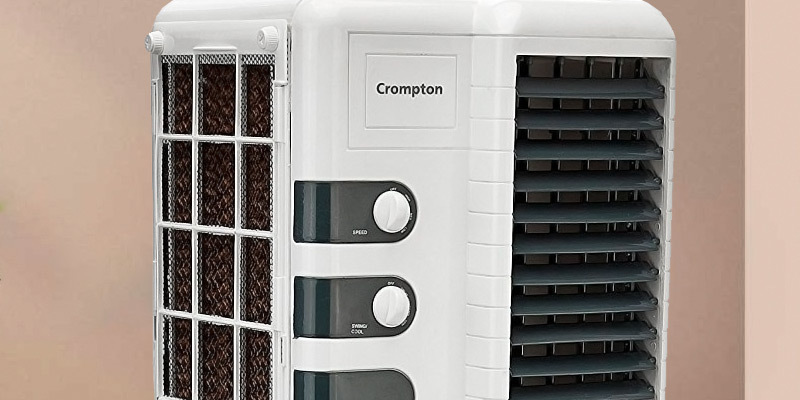 If you're looking for an affordable air conditioner to cool a small space in your home, the GINIE Personal air cooler by Crompton can be the right choice. The VN-D50MH cooler boasts amazing power and general specs that in our opinion deserve a particular consideration. The cooler picks up amazing 3400 CMH airflow and can operate at three ventilation speeds directing the air to all sides automatically. 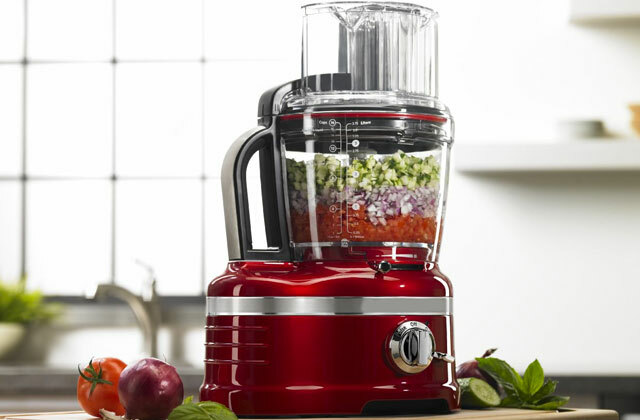 It comes with a generous capacity water reservoir - 50l, so it won’t require refilling too often, and has a handy light indicator on the front panel to inform you about how much water has been left in the tank. 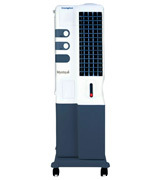 The VN-D50MH evaporative air cooler can be set to blow in a fixed direction or switched to the auto swing mode. It is fair to say the weight and dimensions of the cooler are also impressive. The product weight is 17 kg. The good thing is, you won’t actually need to carry it in hands. The caster wheels at the bottom facilitate its moving and make it easy to navigate it across the room. The DC 2015 boasts of the highest airflow we’ve come across so far - 4000 CHM, and has ample power capacity to cool areas up to 55 square meters. The capacity of the water reservoir of 43l is big enough too to ensure comfortable usage of the device requiring rare refillings. While those who don’t want to bother with maintenance at all can link it directly to a home water system. The distinguishing feature of this particular cooler is its compatibility with inverters, which allows it to provide the optimal temperature even when the main power source is off. It is only a relatively loud operation that has restrained us to give the DC 2015 the highest rate in this review. Although, when you think about it, a device with the power this high couldn’t be totally flawless, could it? 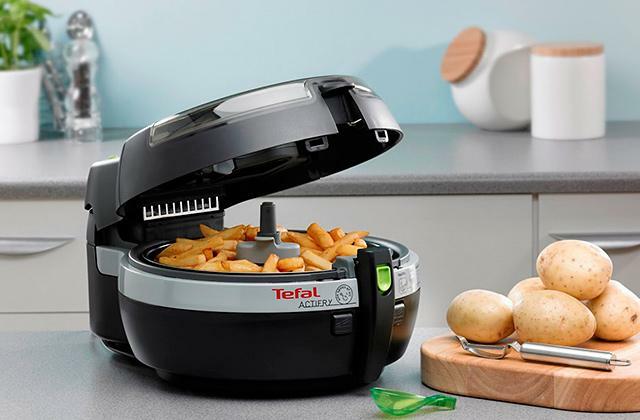 The Symphony Diet 12T is the perfect appliance for small- and mid-sized areas up to 12 square meters and allows for cooling space literally in an instant. The fan blades can be set to move, directing the air round the room, or stay fixed to provide air flow in a certain direction. The speed of the airflow can also be chosen from the three speed settings available. 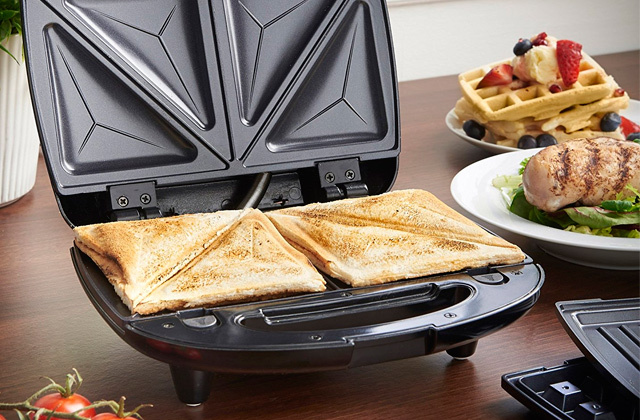 Consumers who look for a portable and save-spacing appliance will also like that the cooler has quite small dimensions and a lightweight design. Also, it is fitted with caster wheels for easy and hassle-free transportation. To our own liking, the Symphony Diet 12T features a one-of-a-kind mosquito net which protects it from clogging and prevents insects from getting trapped inside. 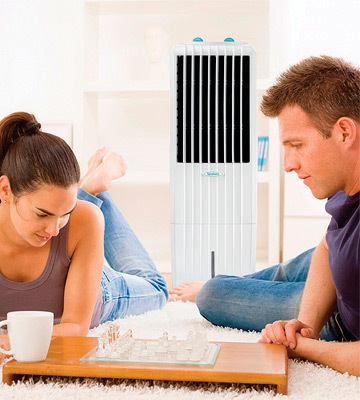 To create an oasis in your own home on a hot summer day, all you need is a tower air cooler by Crompton. The cooler can operate at two speed settings, allowing you to choose either a mild cooling effect or a more intense airflow. The air is circulated evenly throughout the room due to an automatic swing option. The 34l tank water capacity despite being quite average is enough to keep your home cool throughout the night. What makes this tower evaporative air cooler stand out from many other products, though, is its beautiful and modern design. The unit has a sleek grey and white construction design that matches any interior decor and comes with 4 caster wheels for transportation. 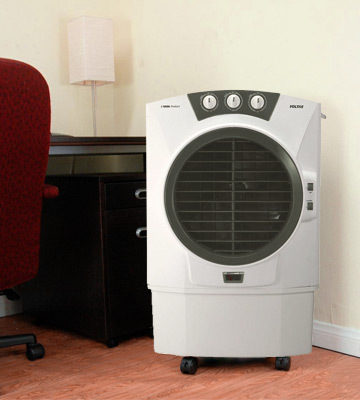 If it is only your bedroom or study that you want to cool, there’s hardly the need in an expensive air conditioner. The GINIE Personal Air Cooler that comes at a very low price is the perfect solution for this very purpose. Due to its small overall dimensions, this cooler fits small spaces perfectly well and can go under or on a desk. The fan can operate at two ventilation speeds and set to blow air either in a fixed direction or to the sides in a swing mode. The only drawback of this model is that it has a low tank water capacity. Compared to other conditioners reviewed on our shortlist 7l seems nothing. Be ready to refill the tank every few hours. Still, as we’ve said above, considering that this is the personal cooler, the low capacity is well compensated with its overall portable dimensions. Every time a stiflingly hot summer comes we wishfully think how great it would be to have a whiff of fresh air. Stop dreaming, start acting! Buy an evaporative air cooler, it is a perfect device to cool and moisturize the ambient air, making it a lot easier to breathe. And it is cheaper than an air conditioner. So, what is an evaporative air cooler? 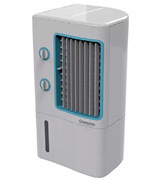 Like we said above, it's a device that cools and moisturizes the air in your room. The mechanism is pretty simple: there is a filter at the back continuously showered with water and the fan that draws the water through this filter causing it to evaporate; thus, the air is moisturized and cooled. These coolers do not require mounting; just plug it in, pour water into the tank, and select a mode. Mostly, they are used indoors but some innovative models work perfectly well outside too. The only limitation here is that as the air cooler cools the air with water, it is designed for dry air mostly. If the air around is already moisturized, the device will be less performing. But in a hot dry air, it will make the difference! And as an icing on the cake, these coolers are really energy-efficient! Your electricity charges will be cut significantly. 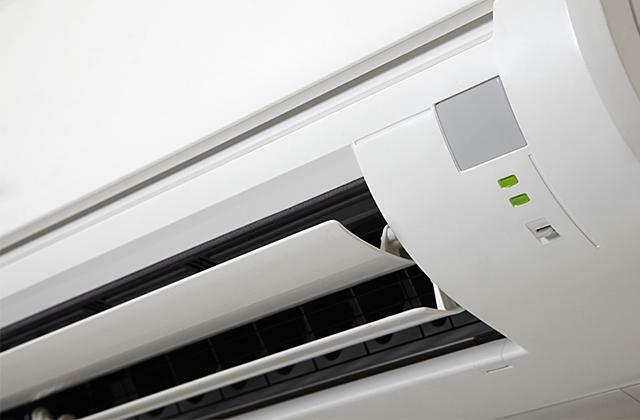 For those living in the regions of high humidity and wishing to maintain comfortable temperatures in their houses, we can offer several other reviews: portable air conditioners, split air conditioners, and window air conditioners. 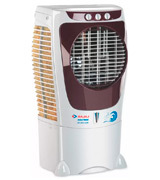 Starting to look for an evaporative air cooler, first, consider its Design and Usability. For example, there are stationary evaporative air coolers that are mounted on the roof and are connected through a special ventilation duct. 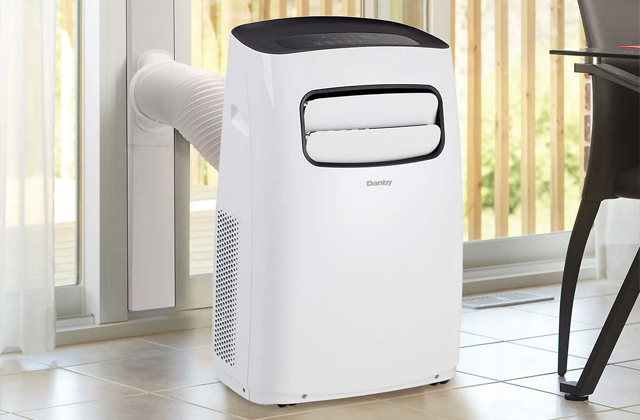 Or there are portable evaporative air coolers that have wheels and can be moved from one room to another. 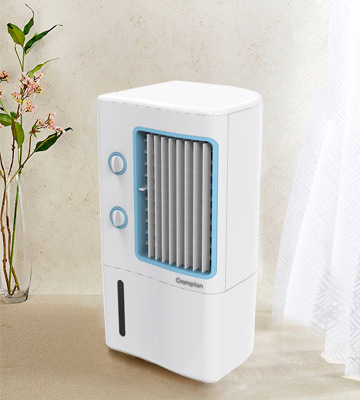 The differences in design are often also important: a slim tower portable evaporative air cooler will be more convenient in a small room than a bulkier one. By contrast, for commercial use, it will be better to buy a monoblock portable evaporative air cooler with a big diffuser. Also, such device can be used outdoors — on a patio, in a garden, or by the pool. The wheels make it easier to move the portable evaporative air cooler. Same as any household device, evaporative air coolers have different technical characteristics, and the most important one is probably the Performance. It largely depends on the room size; the bigger the room is, the more powerful cooler you need, obviously. As the cooler of this type operates by evaporating the water, the water tank volume should also be quite large for the cooler to function longer (before you need to refill the tank). If you are busy or just don't want to refill the tank from time to time, there are models that take water just from the water pipes. The water, in this case, is supplied continuously and you don't need to participate. In a battle "evaporative air cooler vs air conditioner", when discussing energy efficiency, the former wins even without trying. They consume less energy to provide approximately the same temperature. Just look at the amount of energy your future conditioner needs and at its airflow (shown in CFM), compare them to those of an air conditioner. The difference is seen by a naked eye. The last point that we include with the performance is the noise level. We recommend you to keep in mind that more powerful evaporative air coolers might be a bit loud for a small closed room. You buy a cooler to work and rest in a cool room, right? The noise is a distraction, so take it into account. Functions and controls can vary from model to model, too. For instance, the oscillation feature can help you control the air flow direction, and it can be controlled either manually or automatically. Some models can have an additional compartment for ice to prolong the time the air cooler operates at one fill. Also, the ice adds a bit of "frosty" feel to the air. The water level indicator will show (or even notify!) you that it is time to refill the tank. Control-wise, there are two major distinctions — some air coolers are controlled manually and some electronically. Manual evaporative air coolers are easy to manipulate and reliable. 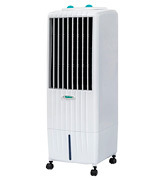 Generally, they might have fan speed adjustment, several operating modes, and oscillation. 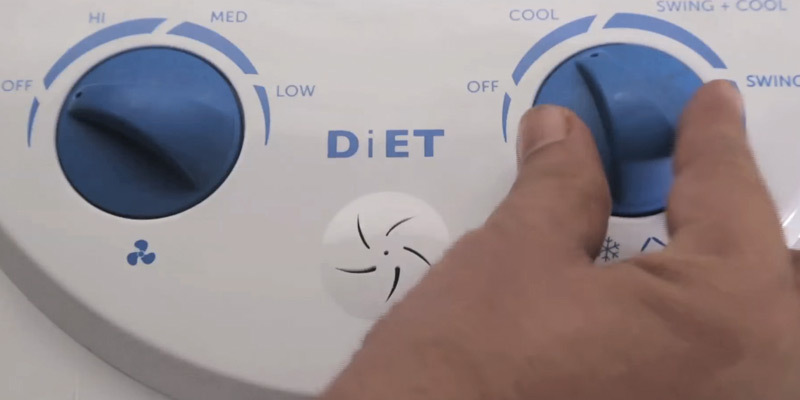 The coolers with electronic control usually have more options. There can be a timer, a sleep mode, an auto-oscillation, a Nature mode, and they can be managed with a remote control. Before you make your final decision and purchase a cooler, carefully think about everything we've mentioned. If you are buying an air cooler for commercial use, a portable device with a constant water supply, high air flow, and mechanical control will probably be the best option. But if all you need is a device to cool and moisturize a small room to get the most comfort, then the smaller size and electronic control might be a better choice. 1. 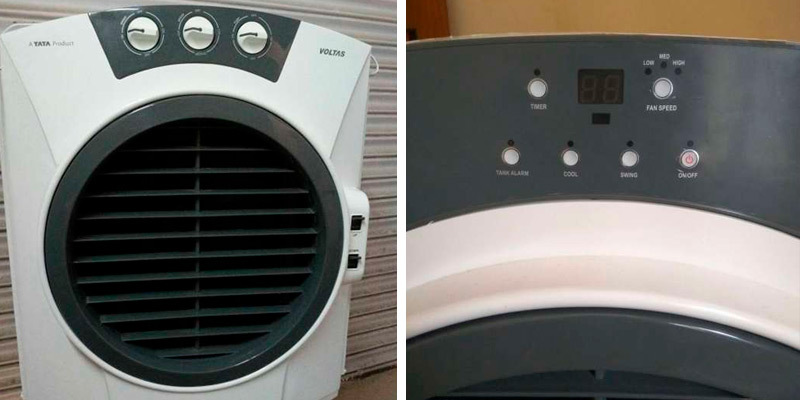 Evaporative Cooler, Wikipedia. August 4, 2016. 2. 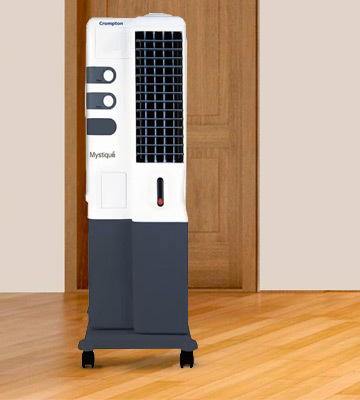 5 Things to Consider When Buying an Evaporative Cooler, Sylvane Inc.
3. How to Size an Evaporative Cooler, Air & Water and Air-N-Water. 4. Astha Shah Top Ten Air Coolers in India by Efficiency and Price in 2016, Bijli Bachao. July 7, 2016. 5. How Swamp Coolers Work, How Stuff Works. 6. How to Buy Evaporative Coolers, Home Depot. 7. EVAPORATIVE COOLERS, U.S. Department of Energy. 8. Anthony Zhou Why You Should Choose Evaporative Cooling vs. Air Conditioner, Behance. August 3, 2016. 9. Evaporative Coolers Information, Engineering360. 10. 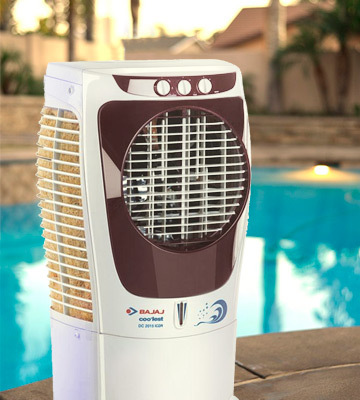 Evaporative Cooler Selection Guide, eZtips. Last review April 22, 2014.